Modality is a grammatical, or semantic-grammatical, category. It is an important component of human languages. This is at least the case in most European languages. To what extent is it a near-universal? This thesis is to contribute to the question. It focuses on modal verbs in English and Chinese, two genetically and geographically unrelated languages, and analyzes what these two languages have in common and how they differ in their systems of modality. To achieve the aim, the thesis adopts the theoretical framework proposed by van der Auwera (1996, 1998 with Plungian, 2001) for the typological study of modality. Its language-specific descriptions involve the morphosyntactic features, notional functions, modal logic, and diachronic development. With these descriptions, it constructs a cross-linguistic database in a uniform, parallel structure. Then on the basis of this database, it deals with the cross-linguistic issues about modality in English and Chinese. Like many of the studies in this area, this research makes use of the well-sampled data in the relevant literature, thereby assuring the same degree of representativeness. When the data do not meet this need, it resorts to computer-based corpora. In the diachronic study of Chinese modality, quantitative analysis is adopted in proposing a development path for the senses of a modal. 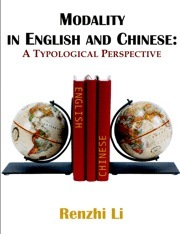 English translation is given particular attention in the description of Chinese modality and cross-linguistic analyses. It is found in this study that the modal systems in English and Chinese are very different things in their hyperonyms, distinctive properties, and syntactic behavior in the assertive, the non-assertive, and the passive. However, the concepts remain useful with respect to semantic functions, pragmatic uses, temporal reference, voice neutrality, and the expression of the meanings concerned with factuality, subjectivity and performativity. In terms of the theory of possible worlds, logical representations, and logical relations, modality can be viewed as a fuzzy set of the semantic domains that involve possibility and necessity. Suppletion and misplacement have nothing to do with the grammatical placement of the negator. Van der Auwera & Plungian's (1998: 98) semantic map is good, but the present study shows that it needs some refinements in the stages of premodal sources, modal developments, and postmodal uses. The harmonic combination of monosyllabic Chinese modals and the lexicalization of the negative modals deserve a position in the map, too. The grammaticalization and degrammaticalization of modality seems to involve a restricted group of notions. This study also shows that when one does cross-linguistic work on grammar, the basis is a semantic map. The rather special types of double, and triple, negation in Chinese are phenomena that previous typological work on modals had not given attention to. One can only know one's own language only if one compares it with other languages. The present study is conducive to a better understanding of English and Chinese. It contributes not only to the investigation of language universals, but also to the study of human cognition and other linguistic or applied linguistic issues. Li Renzhi holds a BA in English Language (Tech) from Xi'an Jiaotong University, China; MA in Linguistics and Applied Linguistics from Essex University, UK; and PhD in Linguistics and Literature from University of Antwerp (UIA), Belgium. He is currently Associate Professor at Shantou University, China.